Rolls-Royce has finally made its way to South America. The venerable coachmaker has been building some of the world's most luxurious and sought-after cars for most of the century, but in all that time, they have never ventured into Latin America. Now, they've entered the Brazilian city of Sao Paulo with their first-ever Latin American dealership located in the Av. Cidade Jardim. 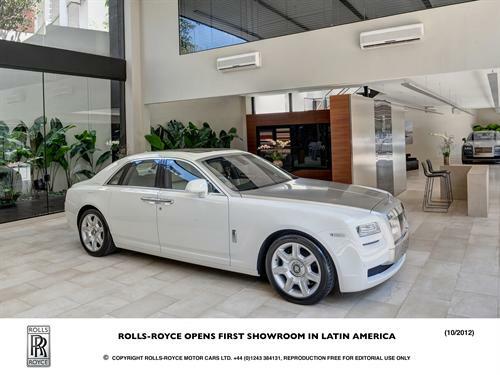 The dealership is Via Italia and is headquartered in Sao Paulo as the first officially-appointed Rolls-Royce dealer there. The new showroom is 500 square meters, all designed to provide a relaxing atmosphere to the world's most discerning clientele. The showroom includes a large glass front, a big open space for the cars to rest in, and a customer lounge with Bespoke-designed furniture and cabinets. Touches from Rolls-Royce in Goodwood, England are present, including carpet samples from the home showroom as well as cabinets, leather, and other surfaces featuring Bespoke themes. The new showroom will showcase all Phantom and Ghost models available for order. A cocktail party to which customers, VIPs, and others were invited, was hosted by Brazilian luxury expert Carlos Ferreirinha and serenaded by Tony Gordon, Brazil's biggest name in soul.